When were the Gospels published? Dr Floyd Nolen Jones responds to claims like these in an article2 “The Gospel Colophons.” In the following I reproduce it in full. Mark wrote his gospel under the influence of Simon Peter, etc. The above commonly appear in Biblical literature and have come to be known as part and parcel of the so-called “Synoptic problem”. To account for the similarities and differences between the Gospels of Matthew, Mark, and Luke, the critics have devised this hypothesis wherein they assert that Mark was written first and Matthew and Luke consulted his Gospel along with “Q”. Thus, these Gospels are said to be the result of interdependence among the three “Synoptic” writers. Indeed, the claim is even made by many that Matthew and Luke handled Mark “critically” (i.e., as text critics). In 2008, Dr. Wilbur N. Pickering3 discovered colophons in numerous ancient manuscripts that contained the Gospels. Colophons are inscriptions, usually placed at the end of a book or manuscript, which normally contain the name of the owner (or scribe) and an attempt at dating the writing. Dr. Pickering states that 16-18% of the 3,000+ extant NT manuscripts (c.500) belong to the Byzantine (Textus Receptus) sub-group designated as f35 (critics subdivide the NT manuscripts into four artificial families: the Alexandrian, Byzantine, Western, and Caesarean). Dr. Pickering has 54 manuscripts (in 2009) of the f35 sub-group that contain the 4 Gospels, and he states that c.95% of these have colophons. About 1,800 of the extant MSS-mss contain the Gospels (some are fragments), and Dr. Pickering extrapolates that 50% have colophons. Thus, approximately 50% of the 500 f35 manuscripts of the Gospel of John have “published 32 years after the ascension of Christ” in the colophons and: 30 + 32 = 62 AD, rather than 85-95! For 50% of the f35 mss to have this information implies that the tradition is ancient, and Pickering has further shown that the f35 sub-family goes back to at least the 3rd century AD. 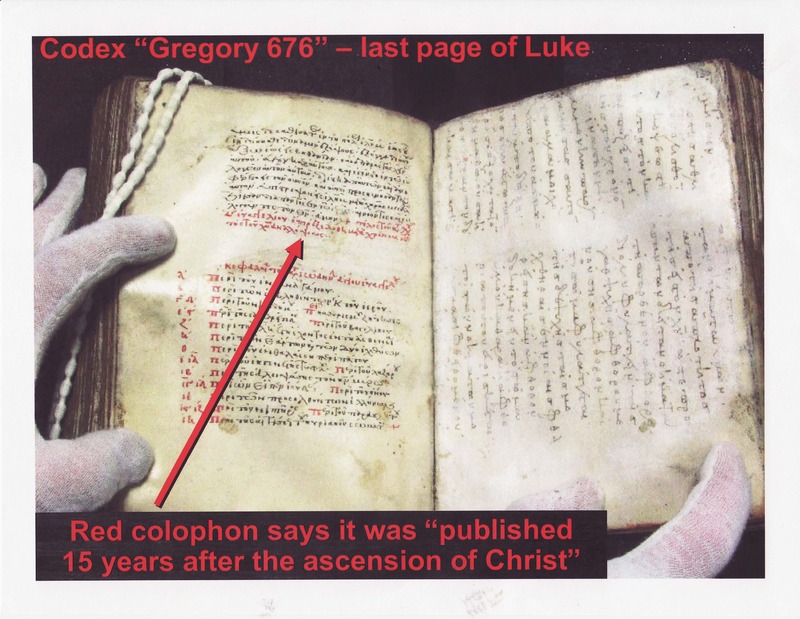 The colophons also record that Luke was “published 15 years after the ascension of Christ” (30 + 15 = 45 AD, not c.60). The f35 sub-group of the Byzantine family is without equal in the MS tradition – about 500 of all the 3,000+ extant manuscripts are f35. Since the f35 mss come from a large, diverse geographic region (Jerusalem, Sinai, Trikala, Mt. Athos, Constantinople, and Rome), the likelihood that they do not represent the main line of transmission is nil. Thus, beyond any reasonable doubt, the f35 Gospel colophons must be seen as valid ancient witnesses and their dates taken as absolutely legitimate. Since they testify that Mark was written two years after Matthew, the so-called “Synoptic problem” is forever slain. The critics merely have theories; we have the facts, and facts are stubborn things. The Gospels, as well as the other books of the Bible, are clearly written as to be self-evident that the authors are portrayed as first-hand witnesses and/or direct receivers of divine revelation. By the very demand of Scripture, nothing less would suffice as a legitimate and legal testimony. Historical reliability of the Gospels, Wikipedia, accessed 10 February 2015. The Gospel Colophons, published in The King James Bible Easy Reader, KingsWord Press, Humboldt, TN, USA, pp. 542,543. Th.M. Dallas Theological Seminary in Greek Exegesis, Ph.D. University of Toronto in Linguistics. This entry was posted in Greek New Testament, The Bible and tagged canonical gospels, colophons, f35 manuscripts, Floyd Nolen Jones, reliability of scripture, Synoptic gospels, the Gospel of John, the Gospel of Luke, the Gospel of Mark, the Gospel of Matthew, The Gospels, The Synoptic problem, Wilbur N. Pickering. Bookmark the permalink. 4 Responses to When were the Gospels published? The accusations presented against the Scriptures often are a no win situation. This is especially true for the Gospels. If the writers had more closely (than even we currently read) written the same exact details they would be even more so accused of plagiarism, hence the inference is that they cannot be independent witnesses. But if they were even less similar in their details than we currently read, they would be accused of making up the stories. In eyewitness accounts of modern day events the eyewitnesses to the same event often report some details differently. Maybe the fact that a lot of the written account in Matthew, Mark and Luke are similar but not identical in all details is evidence of their veracity? Actually, the Synoptic Gospels read almost identical until you get to the events after the women find the empty tomb, then the stories diverge dramatically. Why? The original version of Mark ended without any post-resurrection appearances. That ending was not satisfactory. Why are you just repeating what the textual critics claim? It is not possible to use the word ‘actually’ here, because you have no basis other than the texts themselves to prove the so-call Synoptic Gospel claim. The whole point of this article is to show contrary evidence to that claim. There are many websites where they would agree with you but I do not. As to the allegations regarding Mark’s ending read Why are Mark 16:9-20 missing in most modern Bible translations? and the Comments. The original Greek text of Mark’s Gospel did have post-resurrection narrative, and we still have it. Again you are repeating the false unprovable claims of the textual critics.